Over the past year, blockchain technology has exploded. While the technology has proven largely successful through the original Bitcoin implementation, numerous imitation technologies have emerged, some proving to be better than their founding father. Nevertheless, regardless of which technology proves to be best, the phenomenon that has emerged is a combination of part 1849 Gold Rush, as miners seek to add blocks to the blockchain and are thus rewarded with cryptocurrency, which represents fiduciary gains provided by the specific blockchain technology, part DotCom Boom, as digital companies compete and find uses for blockchain technologies and part Housing Bubble, where investors are looking to cash in on and manipulate the market to maximize financial returns on investment. Let’s take a look at one particular exchange, Ethereum… Ethereum is an open-source, public, blockchain-based distributed computing platform featuring smart contract functionality, it is alarming at the cryptoexchange growth. 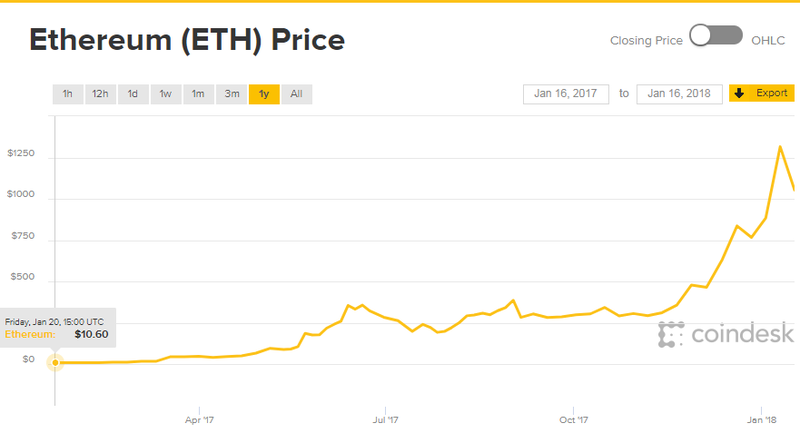 In one year, the price of Ether has skyrocketed from $10 to over $1000. The only plausible explanation is Bubble Madness, of course, but what happens when the bubble bursts on all of these cryptoexchanges? What happens to the underlying systems that depend on blockchain technologies to support their business models? After all, the technology is open source, but the power required to construct blocks is high; in the case of mining a single bitcoin, the estimates range from 100MW and 10GW of power. To understand what even 1GW of power can generate check out the following article: https://energy.gov/eere/articles/how-much-power-1-gigawatt. Given all this, the rise and fall of cryptocurrencies has been exciting and discovering new uses for their application even more so. And it will be interesting to see how government regulation and market demand play out over the next 3-months. If I had to put my money on it… I would buy gold, which is always a good bet. Fake News! Read All About it! Powered by Wordpress. Search theme Flation.